God has called you to have dominion over every circumstance in your life. As a child of God there is absolutely nothing and no one that can stop you! 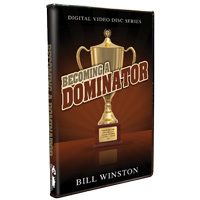 In this powerful and dynamic single teaching Dr. Bill Winston shows you how to take dominion through the Word of God and be victorious over every obstacle you will ever face. It is time to take your rightful place as a Kingdom Dominator. Let the revelation contained in this teaching help you to permanently dominate those things that are trying to dominate you!